For a trip that involved 7 flight segments, it should probably come as no surprise that airfare was one of the big expenses. It just barely edged out lodging–by $66.20. After that, our next biggest expense was food, followed closely by ground transportation, including rental car, public transit, parking, and fuel. Everything else, including tickets for museums, phone service, cash, the canal tour, etc., added up to just under $350. As I just mentioned, we had a total of 7 flight segments, on 5 separate itineraries. The first was Wow Air from Cincinnati to London-Stansted via Keflavik, which cost us $449.97, including one carry-on bag, for the two of us. The return on Wow was the most expensive, at $649.97 from Copenhagen to Newark (also with one carry-on). Our flights to and from Brussels were each a little over $200–$235.80 from Heathrow to Brussels, and $217.40 from Brussels to Copenhagen. At the time we were planning the trip, the BRU-CPH flight together with the return on Wow was cheaper than just a transatlantic flight on Wow from any other destination. The two Brussels segments we booked using frequent-flyer miles. The cost in miles was the bare minimum for Star Alliance flights, of which United is a member. Without the miles, we would have spent about $100 more for each. Most of what we paid was United’s close-in fee, for reserving on short notice, while the rest was taxes and airport fees. The last flight, from JFK to Cincinnati, was a grand total of $11.20. Had it been a United flight, we would have paid cash, as the flights were under $100 each, including taxes and fees. But unlike United, Delta doesn’t charge a fee for close-in booking. We paid the taxes and fees, and that’s it. Add all of those up, and you have $1564.34, for 8,802 miles of flying for two people. That’s 8.9 cents per mile for each of us. Our first night was the overnight flight from Cincinnati to Keflavik, so the only thing we paid was the pain from sleeping on an airplane seat belt buckle. The one night in Amsterdam was the most expensive, at $159.51 including taxes and fees. It was even more expensive if you count the $41.21 we spent on parking there. 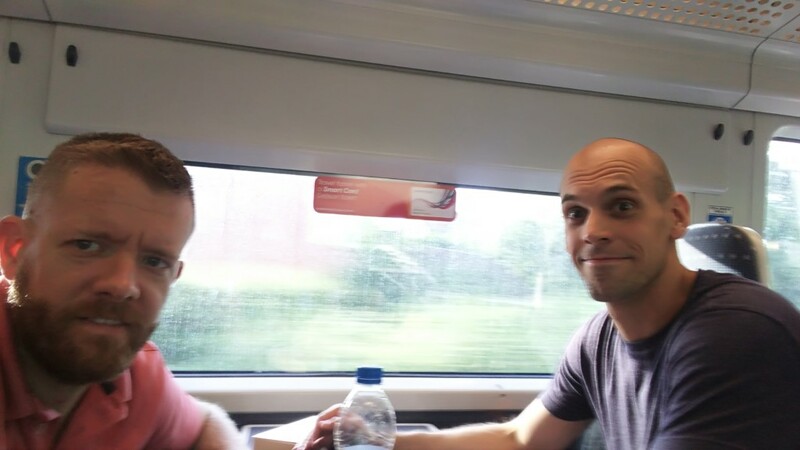 The 3 nights in London were our most expensive single expenditure, not counting the nights where it wasn’t just 2 of us. Those, with taxes and fees, were $285, or $95 per night. At the other end of the spectrum, the nights at John’s place were the cheapest. Ok, that might not be very satisfying. Our cheapest night was $68.91 for a hotel room in Berlin after John and Helga headed home. In between, we had $128.58 for Hotel Newton in New York City, $103.63 (plus $21.41 for parking) at Hopper Hotel St. Josef in Cologne, $88 in Copenhagen, and $67.33 (plus $19.44 for parking) at Ibis Brussels Airport. In Jackson and Berlin, we had lodging for 4, and both stays were for 2 nights. In both cases, we had the entire place to ourselves, including 2 bedrooms and 2 baths. In Berlin, the apartment cost $312.46 (free parking); in Jackson we spent $230.93. If you split that evenly, so that you can compare it with the numbers above, that’d be $78.12/night in Berlin, $57.73/night in Jackson. If you separate the peer-to-peer rentals from the traditional hotels, the hotels were definitely more expensive. We averaged $113.76/night in hotels, but only spent $92.10 going the AirBnB route. Of course, one of those rentals was a bedroom and bathroom in a shared apartment, and the spot in Copenhagen was just a room, with a bathroom shared with the couple that lived there. But those are balanced against the two apartments where we had full kitchens, living rooms, etc. We were pretty happy with all of our stays, with the spots in London and Berlin where we likely got the most value for our money. This is the one expense that really creeps up on you. We spent $883.96 on Food! And that was with only 4 meals you could possibly consider expensive, at $39.45, $56.72, $63.28, and $40.27. There were 31 purchases for less than $10, often drinks and snacks, that made up a significant portion of our costs here. Most of our meals were less than $20 for two of us, and we definitely ate a lot of really good food! With taxes and fees, the rental car cost us $250.83 for a 10-day rental. We spent an additional $320.13 on fuel, and a total of $44.31 in parking fees (all but $3.46 was for the two overnights at hotels in Cologne and Brussels). So in total, the car cost us $618.73. When we look back on our favorite stops, and things we had the most fun doing, the car was a bargain. We wouldn’t have spent time in Cologne, Berlin, or Hannover. We would have missed our most expensive dinner, sitting outside across from the cathedral in Den Bosch. We wouldn’t have gone to Amsterdam or Kinderdijk. And we would have spent a lot more time getting around in Berlin. The car allowed us to see a lot of stuff outside the normal touristy spots, and in turn gave us a lot of enjoyment and flexibility too many tourists miss out on. At 2,230.7 miles (in Europe), the total cost for the car was $0.28/mile. The $0.14/mile on fuel is definitely more expensive than what I spend on my car here (about $0.10/mile), but still quite a bitt cheaper than the RV. Of course, fuel was far more expensive, but the higher mileage made up for quite a bit of it. It was interesting taking a look at the numbers here. It wasn’t surprising that we spent almost $300 on public transit. What was surprising was that $119.74 was in less than 24 hours in New York City, where we already thought we were avoiding public transit because of the cost. I would have guessed that Copenhagen was at the top, where our 24-hour pass cost $46 for two. London was most expensive after New York, at $86.08, with $51.27 of that being the high speed rail trip from Stansted to our apartment. The $59.35 we spent on transportation to and from London’s airports was cheap compared to $96.74 for the same in New York. New York didn’t offer contactless payment or high-speed internet access either. We spent a few bucks in Vienna for 3 days of public transit passes, and about $10 each for our day in Amsterdam. All of those, along with the London Underground ($26.73 not counting the airport trips), were great values considering the number of times we used them. We spent a total of about $350 on everything else. That includes $50 for museums in Vienna, $40 for the SIM card we bought in London, and $61 for the canal tour in Copenhagen. We spent about $183 in cash, which mostly went to parking meters and food, but also included the €14 for the cathedral climb in Cologne. In other words, we probably had $90 in chocolate croissants and $90 in Coke/Pepsi. 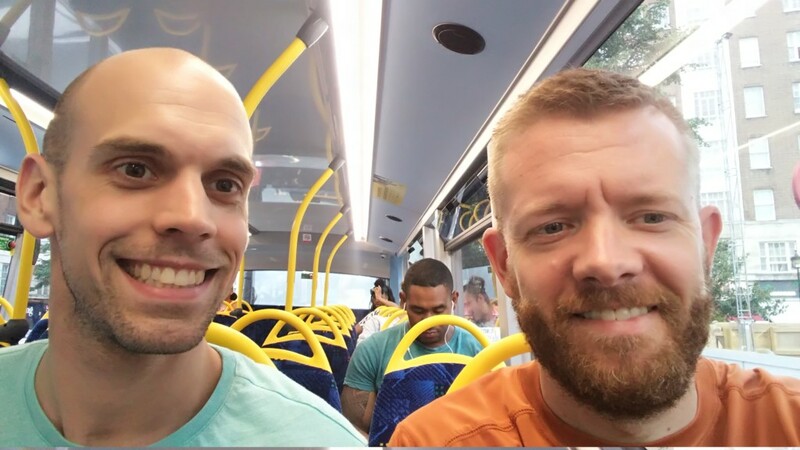 We only took one ride on a red double-decker bus, so of course we rode on the upper level. London’s fleet has 1,000 of these New Routemaster buses in service. Favorite mode of transport: Probably the street trams in Vienna and Amsterdam. Sightseeing was part of the ride that way, and being higher than a car made for nice views. Favorite public transit system: London Underground. Contactless payment, maximum daily rates, and frequent, convenient service made it a winner. 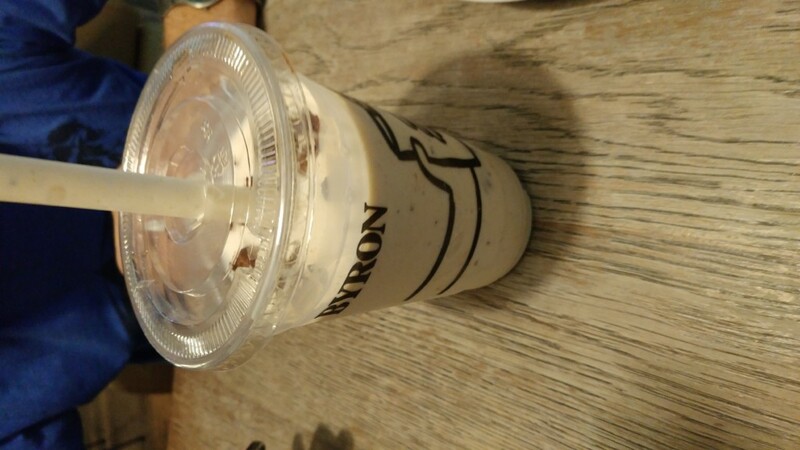 Best milkshake: Byron Burgers’s Mississippi Shake, with chunks of browniee and chocolate chip cookie dough mixed in. One of many variations of pedestrian signals in Vienna. 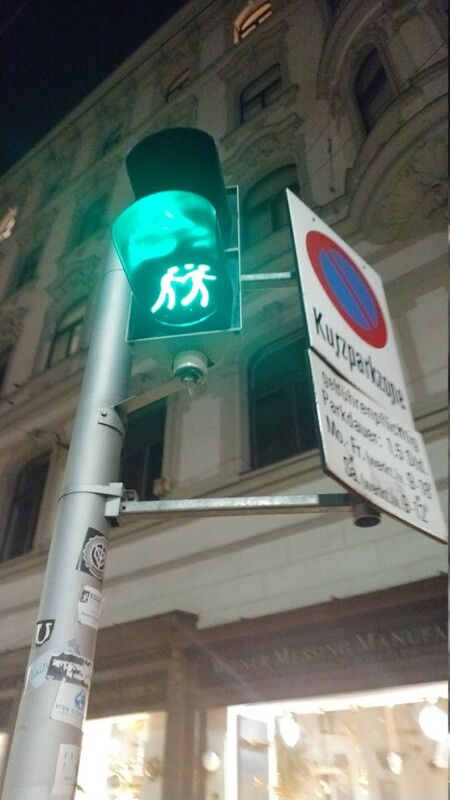 Cutest pedestrian signals: Vienna. 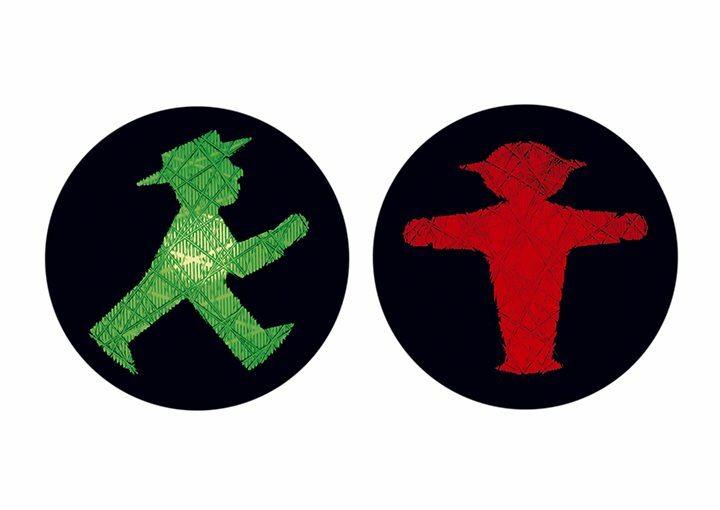 The signals were easily understood with green and red in the usual orientation, but featured a variety of symbols for people walking. Mother and child, businessman, runner, love birds, etc. Berlin had the most “stern” signals, depicting a very deliberate and commanding person with arms extended telling you to stop. Ampelmännchen, or little traffic light man, despite the commanding stature, might also be one of the most ignored outside the U.S.
Amsterdam took the award for most confusing pedestrian signals, which showed countdowns in red that would seem to indicate a time remaining. Nope, that’s the time to wait before getting a “walk” signal phase. 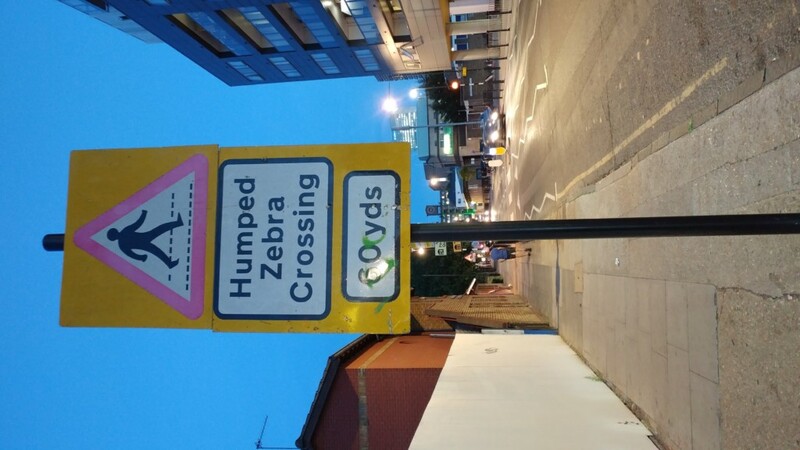 Most idiosyncratic road sign: What’s a humped zebra, and why would it be crossing the street in East London? Of course, it’s referencing the raised and marked crosswalk, which you can see beyond the sign. First place to revisit? Either Berlin or Copenhagen. Berlin obviously has lots of incredible 20th-century history, great food, and was very inexpensive. Copenhagen had lots to see and do, but won us over with how happy and welcoming everyone seemed to be. Hopefully you’ve enjoyed the rather long break from normal RVing stuff. We had a great time, and I never would have guessed that six months later , I’d still be writing about it. Have you had a chance to travel to Europe? Any suggestions on where I should go next?